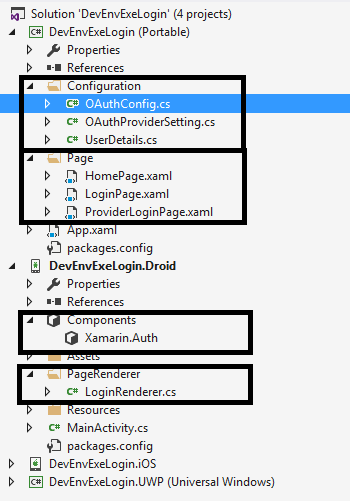 In this article, you will learn about OAuth Login Authenticating with Identity Provider in Xamarin.Forms . OAuth is an authorization framework that enables application to obtain limited access to user accounts on HTTP service on Facebook, Google, and Microsoft etc. Nowadays, there is no need to create registration logic. Alternatively, you can choose using identity provider login. In this case, a person signs up for the app using identity provider login, an account is created for them, and the authentication step is taken care of by identity provider. In this article, I will explain how to implement the below OAuth identity provider in Xamarin Forms and manage the authentication process in a Xamarin Forms application. You can find my previous article for registering mobile app with identity provider from here. 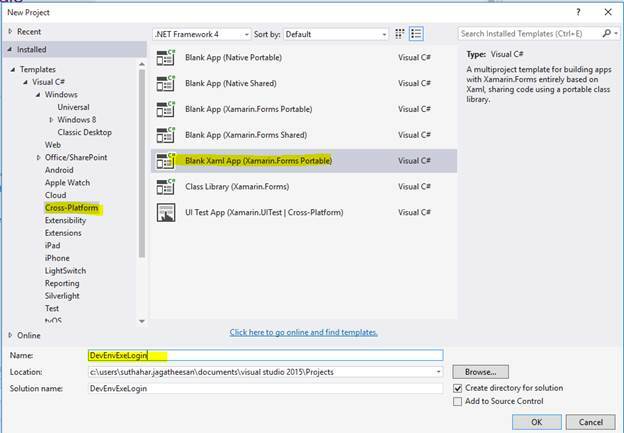 Let's start with creating a new Xamarin Forms Project in Visual Studio. Open Run - Type Devenev.Exe and enter - New Project (Ctrl+Shift+N) - select Blank Xaml App (Xamarin.Forms Portable) template. It will automatically create multiple projects, like Portable, Android, iOS, and UWP but here, I will be targeting only Android. However, the implementation of iOS and UWP is similar. Xamarin.Auth is a cross-platform SDK for authenticating users and storing their accounts. 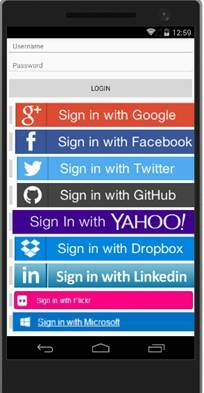 It includes OAuth authenticators that provide support for consuming identity providers. Let's add the Xamarin.Auth component for OAuth. We will have to add this in all platform-specific projects, separately. Go to any project (DevEnVExeLogin.Droid) - Components - Right click on "Get More Components". If you are not logged in already, it will show the login page. So, login there. Next, search and double-click on Xamarin.Auth component and click on "Add to App". I have created quick and simple login screens .You can modify them as per your requirement. Right click on Portable Class Library - Add New Item - Select Xaml Page(Login Page). Add LoginClick event in login page code behind the file and sender object will return the button text name (eg:Facebook,Twitter..etc). As we will be having platform-specific LoginPage implementation of Xamarin.Auth, we don't need any specific implementation in the portable project. We do need to add an empty ProviderLoginPage which will be resolved at runtime and substituted by actual implementation regarding this will explain on step 5. ** In Xaml page, you need to make no changes. We need to create platform-specific LoginRenderer Page. So, you have to create platform-specific Login page (loginRenderer.CS) to iOS, Android, and UWP projects. The below code is for Xamarin.Forms Dependency Service which maps ProviderLoginPage to LoginRenderer. Create OAuthProviderSetting class from Portable Class Library with OAuth Implementation. It is explained in Step 6.
for provider login completed and canceled. If you want to get and save user info. You can create UserEntity from Portable Library and refer the below code. The OAuth2Authenticator class is responsible for managing the user interface and communicating with authentication services. It will support all the identity providers. 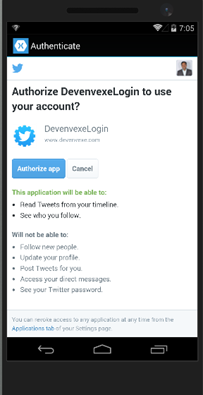 But, in Twitter, OAuth authentication will support only on OAuth1Authenticator. So, you can use OAuth1Authenticator instead of OAuth2Authenticator. The OAuth2Authenticator and OAuth1Authenticator class requires a number of parameters, as shown in the following list. Client ID – Identity provider client ID. While registering the app, you will need unique Client ID. Scope – identifies the API access being requested by the application, and the value informs the consent screen that is shown to the user. Authorize URL – identifies the URL where the authorization code will be obtained from. Redirect URL – identifies the URL where the response will be sent. The value of this parameter must match one of the values that appear in the Credentials page of the project. AccessToken URL — identifies the URL used to request access tokens after an authorization code is obtained. You can download the source code and replace the Client ID or AppID and Client secret.